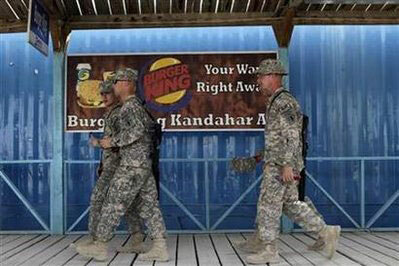 Fast food joints where soldiers wolf down burgers and pizza will soon be a thing of the past at bases in Afghanistan, as the US military reminds soldiers they are at war and not in "an amusement park". In the sprawling military base at Kandahar, the fast food outlets facing the axe include Burger King, Pizza Hut, and the US chain restaurant T.G.I. Friday& #39;s that features a bar with alcohol-free margaritas and other drinks - all set along the bustling "Boardwalk" area of the base. On any given day, the giant square-shaped walkway features the surreal sight of soldiers sipping gourmet coffee and eating chocolate pastries with guns slung across their shoulders, while Canadians play ice hockey at a nearby rink and fighter jets thunder overhead. The US military says its beef with the burger joints is that they take up valuable resources like water, power, flight and convoy space and that cutting back on non-essentials is key to running an efficient military operation. "This is a war zone - not an amusement park," Command Sgt. Maj. Michael Hall wrote in a blog earlier this year. "Supplying nonessential luxuries to big bases like Bagram and Kandahar makes it harder to get essential items to combat outposts and forward operating bases, where troops who are in the fight each day need resupply with ammunition, food and water." Warning that concessions like Orange Julius, Dairy Queen and Military Car Sales were also on the exit list, Hall said less-obvious changes were coming too - including fewer canned and bottled goods coming into the country as well as fewer first-run movie showings and some entertainment programs. For now, fast food joints like Burger King which operate out of little shacks along the Kandahar boardwalk are still doing brisk business, with lines snaking outside their counters, but their contracts are not expected to be renewed when they expire. A motley crew of other stores selling Afghan books, jewelry and phone cards and the busy Canadian Tim Horton& #39;s outlet that sells coffee and doughnuts will stay on. Some US soldiers privately grumble about the cutbacks, but others said they were not bothered by the new edict. Those desperate for comfort food always have the option of the "Chef& #39;s short order" section at the dining halls, where fried calamari rings, fish fingers and burgers are free for soldiers and available in abundance.